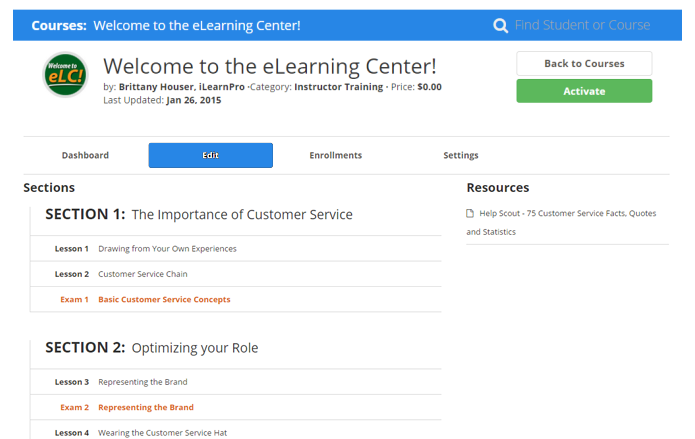 Only Account Administrators with access to all three sections of the course catalog (All Courses, Published Courses and the regular Catalog view) can create new courses. All Courses- This view allows admins to view all courses, including those still under construction, de-activated courses, expired courses and active or published courses. This is also where new courses are created. Course Catalog- The course catalog is the list of courses users view when registering or logging in to take or resume a course. If the students have user groups assigned, this view may vary. Design - Courses in iLearnPro are laid out like a textbook for easy organization. They are comprised of Sections and each section can include both Lessons and Exams. When viewing a course in the course catalog, students can view the course outline to get a basic idea of the content of the course. This outline is built automatically from the titles of sections, lessons and exams. 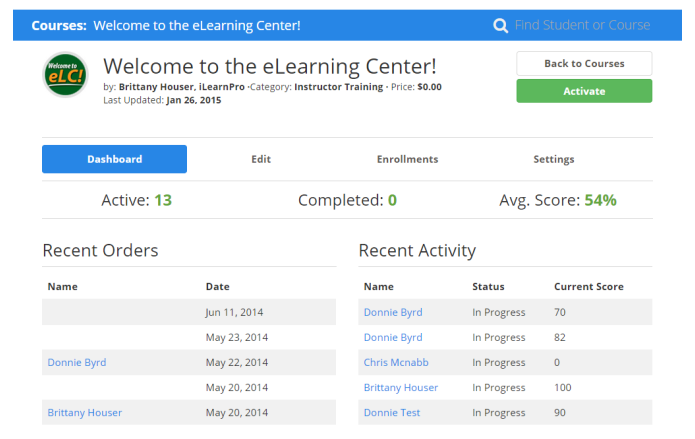 Course Progress - As each student views course material, they gain the ability to look back at specific lessons from the course outline. However, students cannot jump ahead using the course outline without first reviewing the course information in the order that it is presented. Additionally, students must achieve a passing level on each exam encountered to move forward through the course material. NOTE: Users are allowed to retake exams until they achieve a passing score. To create a new course, an Account Administrator must begin by navigating to the Course Catalog. Then click on the All Courses view. NOTE: For the fastest creation time, we recommend having all covered materials and resources organized and accessible prior to entering course creation. STEP 1: New Course Settings. 1. Click on Create New Course. 2. Enter the course information. From the Course Information page, navigate to the Edit section. 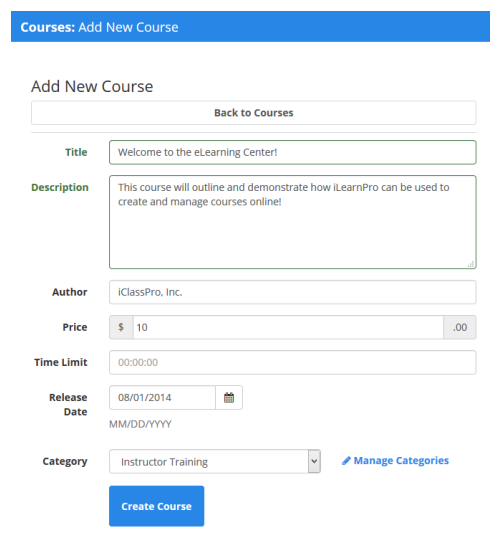 This section acts as a course outline for the author to create and organize course content into a desired order. Courses are split into sections, then into Lessons and Exams. Sections- a category of course content, similar to the sections or chapters a textbook. Each section can contain multiple lessons and exams. Lessons- smaller topics which fall beneath sections and include one or more pages of themed content. Exams- periodic tests over the lesson material covered in a section. NOTE: It is not advised to re-order sections, lessons and exams once students are enrolled and actively taking a course. CLICK HERE TO LEARN ABOUT CREATING SECTIONS, LESSONS and EXAMS! New Video Playlists on YouTube and Vimeo!